Our mission was to create an updated SOG folding knife based on historical proven design but launched from a platform of new technology. Somehow, when you see it, you immediately know it is a SOG. When you use it, you definitely know it is a SOG. At a casual glance it has elements of our original SOG Bowie, Tomcat, SEAL Pup, Flash, etc. Upon a closer look, it has features never before put into a knife. 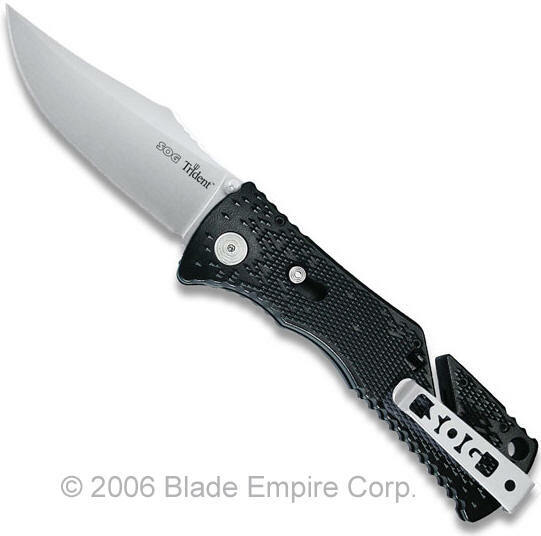 The SOG Trident uses our well-proven means of delivering a knife blade to the open position with S.A.T. Now using our patent pending Arc-Actuator™, the Trident locks stronger and releases easier. There is also a built-in safety to lock the blade closed. When it shows red, you are ready to go. More information on SOG Assisted Technology (S.A.T.™). What also makes the Trident so unique is the patent pending Groove™ in the handle, which allows the operator to cut paracord, fishing line, etcetera without having to open the blade. See the story of the invention of the patent-pending Groove™. The Trident's blade is an evolution as well. Taking key elements from previous blade shapes created a distinct hybrid of form and function. Check out the introduction of a whole new tactile handle concept called Digi-Grip™. With this variable patterning we can create a coarser grip in areas that will require it. Aggressive touch point scallops on the key areas of the perimeter complete the look. You will also appreciate the thought behind our bayonet style clip, which is easily switched for right/left hand carry or removed for pouch storage. The Trident embodies the spirit of our elite special forces throughout the world. The only thing that it doesn't come with is testosterone...you have to supply that. Features a 3.75 in. AUS 8 steel black blade and a 4.75 in. Zytel handle. Comes complete with a pocket clip.